COSSA has released the 2018 edition of its state funding fact sheets, a set of one-pagers that highlight the amount of federal social science research funding that goes to each state, as well as the top recipient institutions and sources of federal funding. 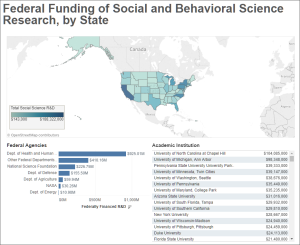 Accompanying this year’s fact sheets is a brand-new federal funding dashboard with an interactive map so you can easily compare states and see how funding is distributed across all the universities within a state. These resources are produced using the most recent available data (fiscal year 2016) from the National Center for Science and Engineering Statistics’ Higher Education Research and Development (HERD) Survey. COSSA’s 2017 Annual Report is out now. Check it out to learn more about COSSA’s activities and successes over the past year. Find out how your organization can become a member of COSSA on our website. On March 6, COSSA hosted a webinar to discuss a recent workshop on Graduate Training in the Social and Behavioral Sciences convened by the National Academies of Sciences, Engineering, and Medicine (NASEM). The webinar featured Robert Kaplan (Workshop Planning Committee Chair) and Amy Stephens (NASEM), who discussed findings from the workshop (the workshop summary is available here) and potential next steps. Slides are posted on COSSA’s website. COSSA is collecting contact information for those who wish to stay involved in ongoing efforts in this area. On March 15, the House Committee on Science, Space, and Technology held a hearing to discuss the National Science Foundation (NSF) budget request for fiscal year (FY) 2019. Witnesses included NSF Director France Córdova, National Science Board Chair Maria Zuber, and NSF Chief Operating Officer Joan Ferrini-Mundy. Science Committee Chairman Lamar Smith (R-TX) presided over the hearing and used his opening statement to express concern about several grants NSF has supported in the past that he does not consider to be addressing issues of national importance, a concern echoed by many other Republican members of the committee. Smith also expressed concern, shared by committee members on both sides of the aisle, that the U.S. is falling behind its international competitors in investment in research and development. Rep. Eddie Bernice Johnson (D-TX), the top-ranking Democrat on the committee, used her opening statement to share her concern with NSF’s budget request being flat compared with the agency’s FY 2017 appropriation, and NSF’s proposed disproportionate cuts to education programs and the Social, Behavioral, and Economic Sciences (SBE) Directorate. Other members of the committee, including Suzanne Bonamici (D-OR) and Paul Tonko (D-NY), expressed concern about the proposed cuts to the SBE Directorate. While not in attendance at the hearing, Dan Lipinski (D-IL) issued a statement for the record that expressed disappointment in the disproportionate cut to SBE. Drs. Córdova and Zuber defended the agency’s support for the SBE sciences. Córdova shared that spectrum auctions, life-saving markets for kidney donations, and research in risk and resilience to natural disasters are all contributions of SBE-directorate supported research. Zuber added that the SBE directorate has supported research to understand what draws people to join violent extremist groups and that SBE-supported research in facial recognition aided in the capture of the Boston Marathon bombers. Drs. Córdova, Zuber, and Ferrini-Mundy answered questions about NSF’s merit review process, U.S. international competitiveness in research, sexual harassment in science, STEM education, and other topics. Their full written testimony and a webcast of the hearing is available here. Read COSSA’s full analysis of NSF’s FY19 budget request here. More than five months into fiscal year (FY) 2018, Congress is finally close to a resolution on the annual appropriations bills. The government is currently operating under a stop-gap spending resolution that will end on March 23 and Congressional leaders are confident that funding for the remainder of the fiscal year will finalized before that deadline. Much of the remaining negotiations are still uncertain and exact timing is unclear. Read COSSA’s complete coverage of FY 2018 appropriations here. Looking ahead to next fiscal year, 161 members of the House of Representatives joined Representatives G.K. Butterfield (D-NC) and David McKinley (R-WV) in a letter to the House Commerce, Justice, Science Appropriations Subcommittee to support a budget of $8.45 billion for the National Science Foundation (NSF) in FY 2019. The letter highlights scientific and technological breakthroughs that have been made possible through NSF funding. Earlier this month, the White House Office of Science and Technology Policy (OSTP) published a 12-page report detailing the “tremendous” science and technology achievements made during the first year of the Trump Administration. According to the report, OSTP “has built a robust team of over 50 staff members,” although the size of the office is less than 40 percent of what it was under the previous Administration, and the President has yet to nominate an OSTP Director or a science advisor. The report describes accomplishments, such as the awarding of Nobel prizes to National Science Foundation-funded scientists whose research was supported during previous administrations, in the categories of Artificial Intelligence & Autonomy, Biomedical Innovation, Connectivity, Cybersecurity & Government IT Services, Digital Economy, Energy Dominance, Homeland Defense & National Security, Opioid Epidemic Response, Scientific Discovery, Space Exploration, and STEM Education.